We love springtime!! It is that time when everything comes out of hiding from the cold. The APRHF does that also. Winter is the time to plan, catch up on paperwork and make contacts. When the temps are right it is time to go out and get rolling on projects no matter how mundane. 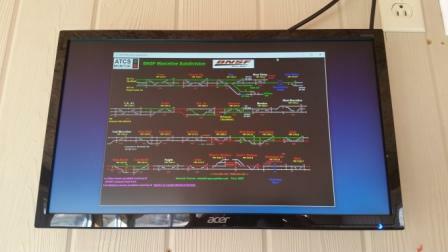 Our ATCS monitor screen at the lookout went bad. Lets get a new one and fix it before all of our guests arrive to watch trains. The old and the new Monitor. I was quite glad our lookout caretaker Rob found this issue before the visitors came in over the next couple of weekends. 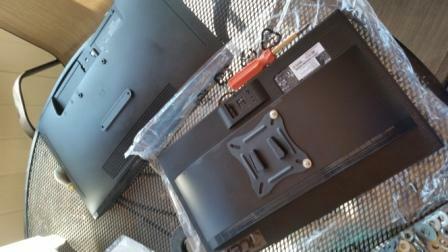 The old monitor screen went blank. All fixed! The resolution is much better. After the screen was replaced, It was time to pick up limbs along the lookout road. 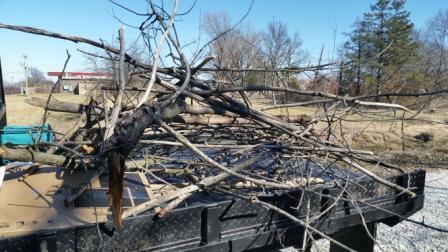 Got a decent pile of limbs picked up and a tree set to the side to cut up later. Yes this is mundane work that has to be done all the time to keep things looking as good as possible. Pretty soon more trees will be cleaned between the lookout point and lookout point park. That will allow us to make sure the drainage is working properly, fix what we know is not draining properly and maybe find where the washout on the lookout road is draining too. Sure would like to keep that hole from showing up all the time. Winter time gave us a few presents. The road looks much better now. The work is never ending. If you would like to volunteer some time and help do some chores like this. Please do not hesitate to email us (info@aprhf.org). This year will be full of prep work and foundation setting for our Exhibition of Amtrak Histories new home. Complete information is available here. We are still trying to get that contact stream set between BNSF and APRHF to get the rail and ties donated for the foundation of the Exhibition that will be built this year. That will be a pivotal thing to fast forward that part of the project. Our board meeting is this weekend April 6th, 2019. We are going to go over the plan of where to start on the rest of the Lookout Point Park project. We will be discussing ROI’s (Return on Investments) and costs to build each piece. This will allow us to get things rolling piece by piece. 2019 will have some action and a lot of planning. 2020 should have lots of action. Membership is key. Please share this around to your friends and family. Your membership goes directly to help make these projects happen. Membership information is available here. One more notable project that is coming in on April 7th. There will be a new Virtual Railfan live stream cam installed at the lookout point. This one will replace the one that used to feed directly to the hotel. It’s location will be moved to a better viewpoint for beautiful views all up and down the track. It will also be mounted in a way that does not impede the view of the live visitor that wants to video or take their own photos from the deck. We are all about passenger rail history as you will see through this project like never before. We are also about the enjoyment of passengers rail and trains as a whole in today’s world. Thank you all for your support and get that membership to stay completely up to date on all the exciting things to come. Now where did I put my chainsaw?